Many state and federal policymakers have been working to cut the length of mandatory minimum criminal sentences and reduce the size of the correctional population . While welcoming the billions of dollars these reforms save U.S. taxpayers, some observers fear that cutting back on punishment will inevitably translate into increased crime. Such understandable anxieties will be eased by a remarkably successful policy experiment in the state of Washington’s criminal justice system. The state had traditionally imposed jail sentences of 30, 60, 90 or 120 days for supervised offenders who violated the conditions of their probation or parole (e.g., had a positive drug test). The policy was fiscally costly and also resulted in inconsistent responses to the same violation. According to Professor Zachary Hamilton at the Washington State Institute for Criminal Justice, “If the local jail didn’t have room to take someone for 30 or 60 or 90 days, offenders got away with things they shouldn’t have. If the jail was empty, offenders might serve 30 or 60 or 90 days for a minor violation.” Not only was this policy unfair, but it also gave offenders no consistent incentive to change problematic behavior. Seeking a less expensive, more effective system, the state fundamentally reoriented its strategy. Punishments for violations were made much less severe, most commonly a “flash incarceration” of up to three days. Unlike the prior penalties, such short jail stays could be administered swiftly and certainly throughout the state. “The program relied on a theory of criminal behavior that goes all the way back to Jeremy Bentham,” said Hamilton, referencing the 18th-century British philosopher. “People are deterred more by their likelihood of getting punished than by the severity of the punishment they might face if they get caught." 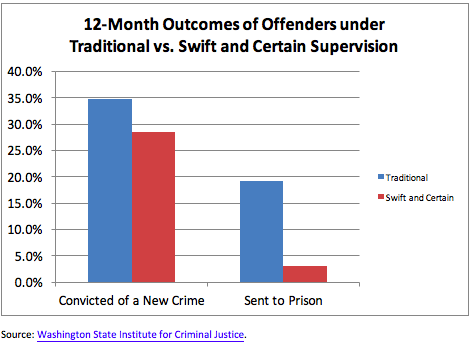 In a 12-month study of over 9,000 supervised offenders, Hamilton and his colleagues found that supervision using swift, certain but modest punishments produced a significant decrease in the likelihood of offenders being convicted of a new crime. And not only were new convictions less common, but they were also less serious, enabling the swift and certain approach to produce a stunning 84 percent drop in the odds of a supervised offender being sent to prison. Because of the savings this produced, swift and certain supervision was less expensive to operate than the traditional model, allowing expansion of mental-health and addiction-treatment services for those offenders who needed them. Many people assume that the only way to reduce crime is to increase the severity of punishments. But Washington’s experience shows that if the criminal justice system allocates its punishment resources more wisely, it can reduce punishment and crime at the same time.